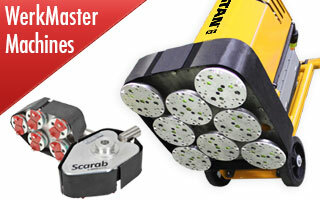 Take advantage of the great savings for these floor grinding machines while they are still in stock! 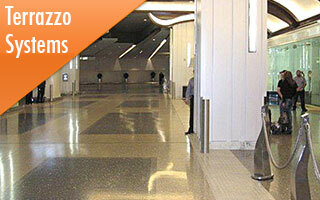 Custom designed programs to meet your facilities requirements. At WerkMaster, we are proud to be one of the most innovative and effective manufacturers of concrete surface preparation equipment; stone, terrazzo and concrete polishing equipment, as well as hardwood floor sanding equipment. 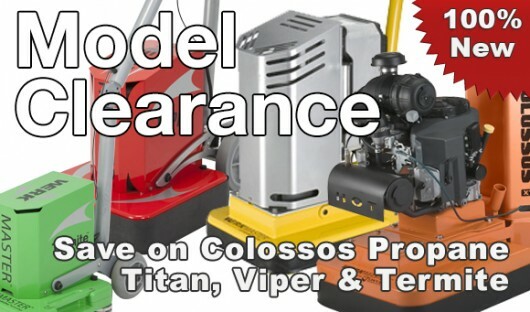 Our floor finishing and countertop refinishing tools are really 7 Machines in 1: Grinder, Stripper, Sander, Polisher, Buffer, Burnisher and Edger.. Best of all, our Termite XT, Viper XT, Raptor XT, TITAN XT and COLOSSOS XT models edge to within 1/8” (3mm) of the wall. Want to get even closer? Try the Scarab – it takes you right up to the wall. Our Stealth propane burnisher models feature a built in vacuum and industry leading safety features found only in our CLEAR SKY technology. 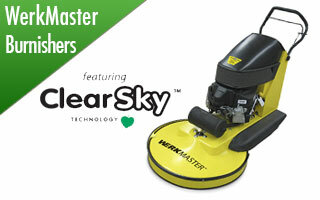 Both our Stealth and our Spectre propane burnishers have ClearSKY technology for a safer, cleaner work environment.. 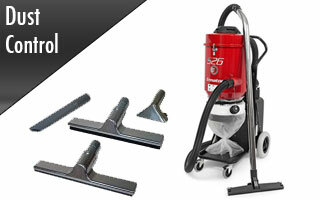 Whether you are looking for a concrete grinder for surface prep to remove epoxy coatings or to polish concrete, or for a floor sander for refinishing hardwood floors and wood decks, or for a machine to polish marble, granite or terrazzo floors – WerkMaster has a machine to fit your needs and your budget. Our Request Quote Form helps to ensure you get the right machine and tooling for any size job. At WerkMaster, you’ll also find a wealth of options regarding purchasing, leases and rentals for our many sizes, styles, and types of floor finishing machines. Why are WerkMaster machines the best choice when it comes to grinding, strippnig, sanding, polishing, buffing, burnishing, edging and surface preparation of all kinds? Let us show you! 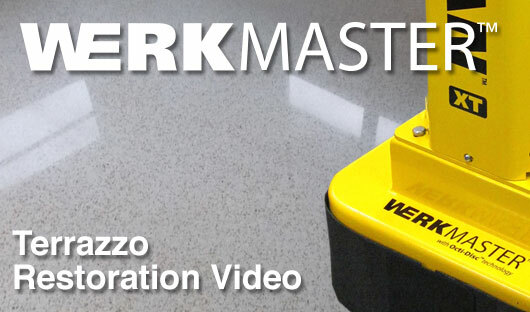 WerkMaster has developed a patented proprietary technology that we use on all our facility maintenance and floor finishing machines. We call it Octi-Disc Technology, and you’ll call it unbelievable! 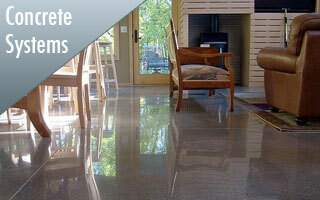 Our Octi-Disc technology utilizes eight independent polishing heads that operate collectively, allowing a smooth, even shine or grind on any type of surface, from concrete to hardwood to marble, granite, Ceasarstone and terrazzo. Since our concrete surface preparation equipment use eight heads instead of one, they spin at much higher velocity. This means more revolutions per minute – and more RPMs means more raw grinding, sanding, polishing, edging, cleaning and buffing power! Unlike many competing brands of planetary grinders and polishing equipment, our patented Octi-Disc technology allows you to clean and polish your entire floor from wall to wall. Octi-Disc heads will polish and grind to within one eight of an inch of the wall – a mere three millimeters! No more embarrassing strips of unpolished floor around the edges of your room, and no more bending over with a handheld grinder to finish off your polishing job. 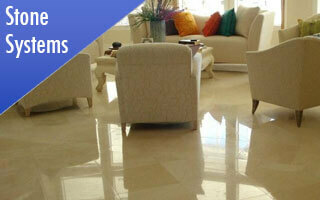 With WerkMaster, you will get the entire floor done efficiently, quickly, and completely every time! 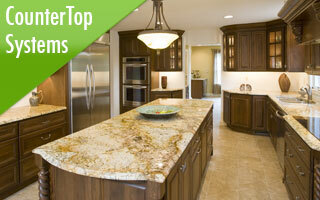 When a floor or countertop requires polishing, nothing outshines a WerkMaster! 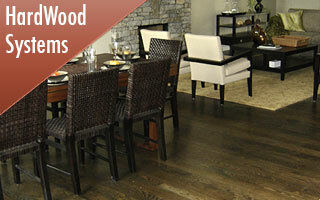 Our ULTRA-FLEX Plug ‘N Go Technology allows you to follow an uneven floor, and to flatten floors and countertops. Our advanced diamond abrasive polishing tool design delivers uncompromising results faster and easier than any planetary grinder. 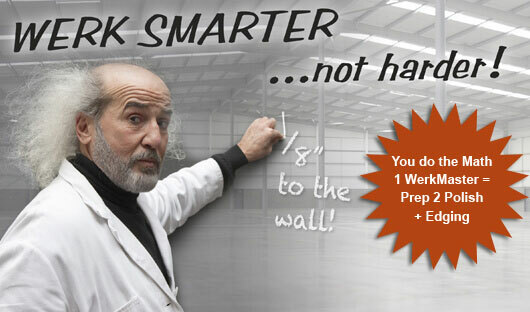 WerkMaster diamond abrasives deliver deep, crisp, clear mirror finishes that are the hallmark of WerkMaster. WerkMaster’s Variable Frequency Drive allows you to dial in your perfect sweet spot from 450 RPM all the way up to 1800 RPM for optimum performance and productivity. An additional advantage of our unique Variable Frequency Drive is that you can run the Viper XT and Raptor XT on 220 Volt or 110 Volt power using a Quick 220 Voltage Converter. 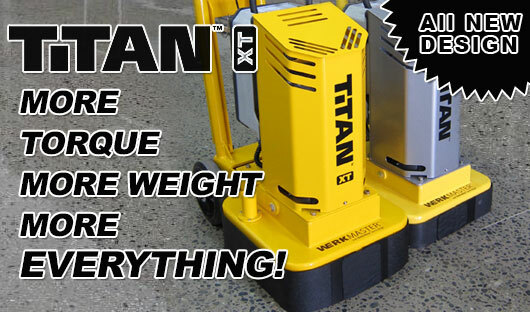 The TITAN XT can run on both 220 Volt Single Phase or 208 Volt 3 Phase. Whether you are plugging into a dryer outlet or a 3 Phase commercial outlet, the VFD drive automatically senses the power you are plugged into and adjusts the drive accordingly. For our North American customers, the COLOSSOS XT has a proprietary design allowing you to plug into either a 230 Volt 3 Phase or a 460 Volt 3 Phase power source. Our European customers can plug the Scarab, Termite XT, VIPER XT and Raptor XT directly into a residential or commercial electrical outlet. The TITAN XT and COLOSSOS XT plug directly into a 380 Volt 3 Phase outlet. Our UK customers will soon be able to plug the Viper XT and Raptor XT into both 110 volt and 220 volt power. Tired of power cords, then choose between the TITAN XT Propane or the COLOSSOS XT Propane featuring our Clear Sky Technology. Enhance the protection and shine as well as maintain your beautiful ULTRA Floors with the most advanced, safest Propane Burnisher in the market. Our 21”and 28” Stealth and Spectre high speed Propane Burnishers with Clear Sky Technology, feature the lowest maintenance and highest safety features, exceeding EPA and OSHA safety standards. 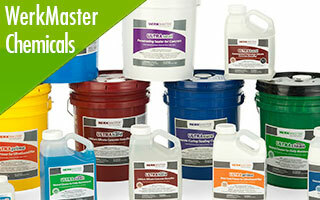 WerkMaster also offers a line of densifiers, sealers, and cleaners. WerkMaster ULTRAguard sealers and ULTRAhard densifiers deliver up to 24 Hour Protection from oil, brake fluid, antifreeze, phosphoric acid, wine, vinegar, mustard, coffee, pop, battery acid, and other acid based staining agents. 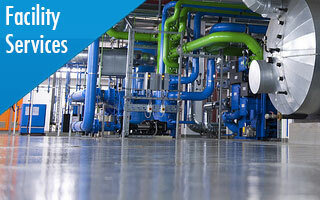 ULTRAguard provides an industry leading COF of 0.7 on the James Scale. 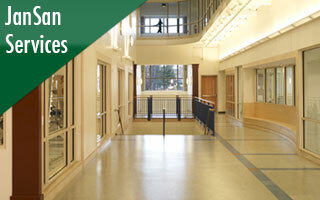 All WerkMaster floor enhancement products feature zero or very low VOC content, are water based, and are CFIA approved (Canadian Food Inspection Agency). Not only are WerkMaster machines the Best Built in the industry, as all components are manufactured in North America to rigid standards, we are also the only manufacturer offering a 3 Year Parts & Labor Warranty. WerkMaster is pleased to offer you a host of services on our site to make your purchase or lease process easier and to ensure you get as much value as possible out of the WerkMaster surface preparation and facility maintenance machine you decide to try. Our lease page provides you with a quick and easy application to get the ball rolling. Our repair and maintenance page provides you with quick and easy solutions for commonly encountered problems. 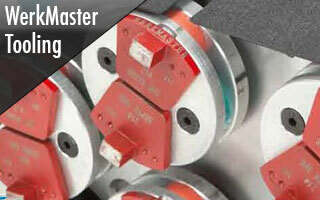 If you are looking to Rent a WerkMaster, check out our rental page. 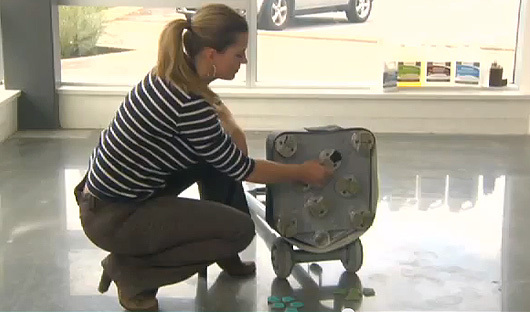 Want to learn How to Polish Concrete, Refinish Terrazzo, use a MOHS Hardness Test Kit, or How to Seal a Concrete Floor – you’ll find our Learning Center with Training Videos a big help. Find out why our partners, Home Depot, Braxton-Bragg, Global Industrial Supply, and customers (like the TTC Toronto Transit Commission) love our products, our service and our support. Stay abreast of the latest updates and developments by reading our Press Releases and subscribe to our newsletter; it features How To Tips, White Papers, Product Updates, Sales Specials and more. Call today Toll Free 1-866-373-WERK or 1-604-629-8700 and we will be happy to assist you in finding the Right Solution to meet your needs. Copyright © 2013 WerkMaster Grinders & Sanders Inc. All Rights Reserved.